Auto Refractor, FDT Visual Field Test, Topographer, auto keratometer, auto lensometer. Computerized Visual Field testing is imperative in the diagnosing and monitoring of many ocular diseases affecting the retina and decting neuro-ophthalmic disorders. Visual field testing is important in early detection of glaucoma. Systemic conditions such as multiple sclerosis and brain tumors may also be detected by this instrument. Due to the severity of conditions that may be detected, Dr Reed performs a computerized visual fields screening on all patients over the age of 10. This instrument determines the refracting power of the eye. The measurement aids Dr. Reed in determining the optimal eyeglass prescription. It also allows Dr. Reed to provide a fast and accurate prescription for non-verbal patients, the elderly and young children. Digital Retinal Photography provides a magnified permanent image of the retina to help monitor disease progression and establish a base line for future reference. It is espically helpful for following diabetic changes, hypertensive eye disease, macular degeneration, glaucoma and many other conditions. Computerized Lens Analyzer for accurate reading of previous and new prescriptions. This valuable tool allows our staff continuous feedback and notification of special situations, such as lens distortions or rapid power changes. Computerized Corneal Topographer to survey the cornea and provide a detailed topographical map of its shape. If you are considering new contact lenses or thinking about refractive surgery (a vision correcting procedure involving the cornea), this information is vitally important. This test can detect slight conditions often invisible to even the most thorough examination. 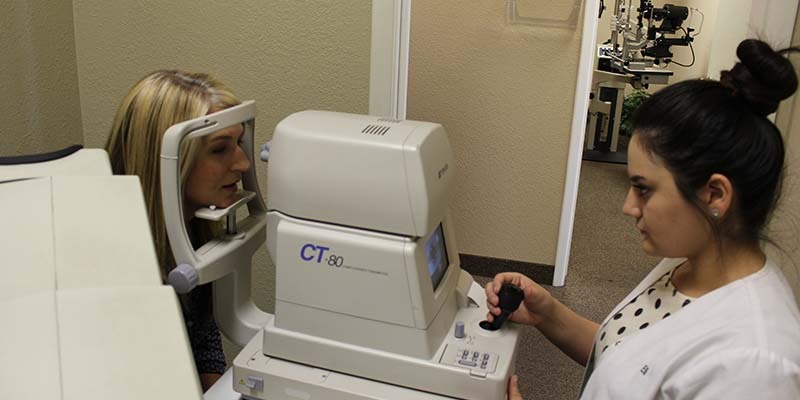 The system can also help Dr. Reed monitor subtle changes on your cornea over time. Glaucoma is a loss of your peripheral visual field due in part to increased pressure inside the eye. When the pressure is approaching an uncomfortable level, Dr. Reed may order other tests to be performed and consults with you regarding the results. Computerized Auto-refractor/keratometer This instrument allows immediate patient verification of their prescription. Complete testing is performed including near vision, glare, low contrast, children and non-verbal patients. The results are accurate and fast every time, even with children and the elderly.